Thar Dessert is the biggest civilized dessert of the whole word and other facts. The Thar desert sands overlie Archean (early Precambrian) gneiss (metamorphic rocks formed between 4 billion and 2.5 billion years ago), Proterozoic (later Precambrian) sedimentary rocks (formed about 2.5 billion to 541 million years ago), and more-recent alluvium (material deposited by rivers). Thar Desert or Great Indian Desert is also called Lavana Sagra which means salty at place. It is known as the most civilized desert of the world. It forms a natural border for India and Pakistan. 85% of Thar Desert lies in India whereas rest, that is, 15% of it lies in Pakistan. In India, Thar Desert stretches to Rajasthan, Haryana, Punjab and Gujarat. In Pakistan, it stretches to Sindh to that of Punjab in Pakistan. It is said that Lord Ram of Ramayana created Thar Desert. The story goes that he was forced to dry the ocean with his arrow or astra because he had to pave a way from India (then Aryavarta) to Sri Lanka (then, Lanka). He had prayed to Ocean God for some way but ended up being driven to no other choice. After he put the arrow to his bow, a terrified Ocean God emerged from water and told him to stop. He gave way them by reducing the water force or in certain cases, dividing the ocean. Ram asked him what he should do with the arrow as such a great weapon should not go in vain. Rama did as he was told. Translation: The weapon whose splendour matched thunder and lightening bold was sent by Rama. It hit the desert of Maru (now Mewar). वरम् तस्मै ददौ विद्वान्मरवेऽमरविक्रमः || २-२२-४०The place the arrow hit, emitted a guttural sound. Water of the penultimate subterranean region gushed out of the cleft. A lake called Vrana formed. From it, water constantly gushed out. It resembled sea water. After few hours, water dried up. रामस्य वरदानाच्च शिवः पन्था बभूव ह || २-२२-४२Ram gave Maru a boon. It became the most congenial place for cattle rearing, with little to no disease, producing tasty fruits and roots, clarified butter, lots of milk and various sweet-smelling herb. Deserts are known for their sand dunes. Thar Desert is not different. The soil remains dry for much of the year. It is prone to wind erosion. High velocity wind blow the soil from the desert, despositing them on neighbouring fertile lands and causing shifting sand dunes within the desert. To check the shifting sand dunes, Acacia tortilis is planted. The Arna Jharna museum is located in the Thar bioregion that extends from the edge of Aravallis in the east into the provinces of Punjab, Sindh and Pakhtunwala and down to North Gujrat. Rainfall is limited and groundwater tends towards salinity and excessive mineralization. Despite the difficult terrain, the desert does bloom and a wide variety of hardy plants comprise a vegetative zone called North Western Thorn Scrub Forest consisting of perennial and annual grasses, shrubs and small trees. The native plant species have adaptation that enable them to reproduce, grow and survive in the most inhospitable edaphoclimatic condition. Some plants have evolved special root system while others have unique leaf characteristics that allow them to withstand prolonged periods of drought. Many woody species simply lose their leaves when soil moisture conditions become too dry. In general, the plant species of arid zone have xeromorph logical leaf structure, physiological control of transpiration and metabolism, moisture and nutrient storage organs, and thorns. The prevalent wildlife includes the leopard, the Asiatic wild cat (Felis silvestris ornate), the chinkara (Gaella bennettii), the chousingha (Tetracerus quadricornis), Blackbuck (Antilope cervicapra), the Bengal desert fox (Vulpes bengalensis) and various reptiles. The Thar desert is home to varieties of raptors from critically endangered red-headed vulture (Sarcogyps calvus), white rumped vulture (Gyps bengalensis) and Indian vulture (Gyps indicus). As well as near threatened species of raptors like steppe eagle (Aquila nipalensis), imperial eagle (Aquila heiaca), pallid harrier (Circus macrourus), laggar falcon (Falco juggar), and the short-toed (Circaetus gallicus), tawny (Aquila rapax) and spotted eagle (Aquila clanga). Water harvesting and careful soil management has transformed the site into well-watered site, with a rich cover of indigenous, resilient desert flora, an ideal nesting ground for the numerous birds of the area. James Todd described the origin of a popular Merwari saying: ‘anwal, anwal Mewar, bawal, bawal Marwar’ which makes plant the basis for territorial divide between frequently feuding states. Maharana Bheem Singh explained to him, ‘Wherever the anwal (Cassia aurigulata) puts forth its yellow blossom, the land is right ours. Let the marwaris enjoy their stunted babuls (Acacia nilotica), their karil (Capparis decidua) and ak (Caliotropis procera) but give us back our sacred pipal (Ficus religiosa) and the anwal of the border’. To evade or minimise the adverse effects of frequent drought, the native people in arid zones have often developed production system in which woody perennials have a very important role, both form productivity as well as resource conservation point of view. The Bishnoi tribe practice ‘ecoreligion’ that holds all life forms including trees to be sacred and go to great length to conserve the ecology of their area. The story of the courageous Amrita Devi Bishnoi is legendary and seen as a precursor of the late Chipko movement. 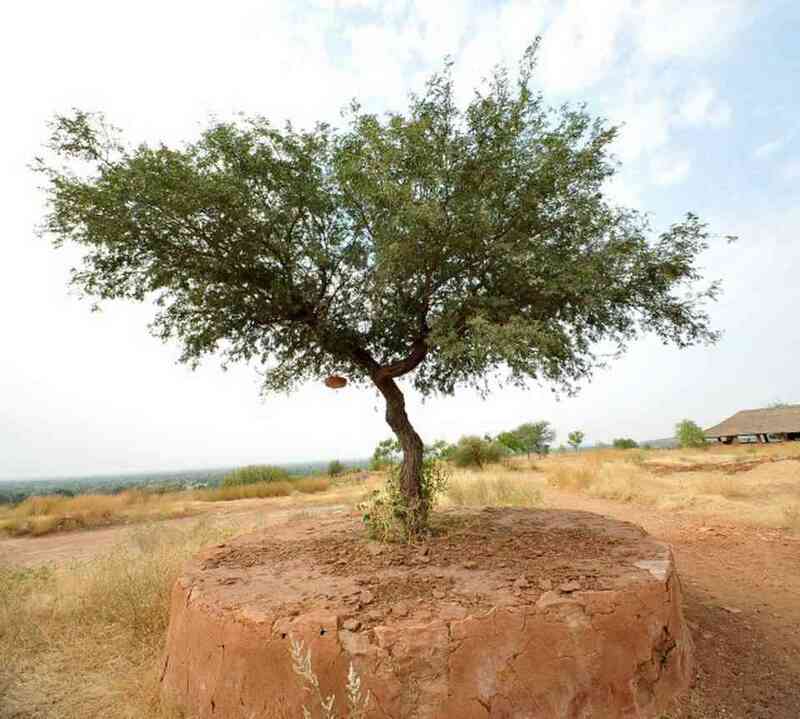 Amrita Devi Bishnoi sacrificed her life to protect khejri tree. Her three daughters followed suit, followed by other Bishnoi. The mass slaughter led to a royal order, prohibiting the cutting of any tree in Bishnoi village.